Your chance to live in a maintenance-free neighborhood is here! Welcome home to 4220 Peterborough Rd. This charming craftsman-styled home is perfect for every buyer. Offering 3 generously sized bedrooms and 2 bathrooms, this show-stopper is perfect in every way. The open floor plan offers exceptional entertainment possibilities. Entering through the large foyer, you are greeted by beautiful tile flooring. The corner fireplace in the expansive great room, flooded with natural light, coupled with rich hardwood flooring, allows for the perfect binge-watching atmosphere. The kitchen offers ample counter space, a breakfast bar, and a Frigidaire Stainless kitchen package. Hosting get-togethers, game nights, and even the in-laws is an enjoyable experience in this well-designed home. The laundry room is complete with abundant amounts of storage with upper cabinetry and a laundry sink. The owner’s retreat, with access to the 18x16 screened-in porch, has quite the en suite. The enormous walk-in tile shower is a passage into a spa-like bliss. The retreat is completed with a Carrie Bradshaw-esque closet. The Executive Village is meticulously maintained every season of the year – with lawn maintenance (and snow removal) included, living here truly is easy and carefree. 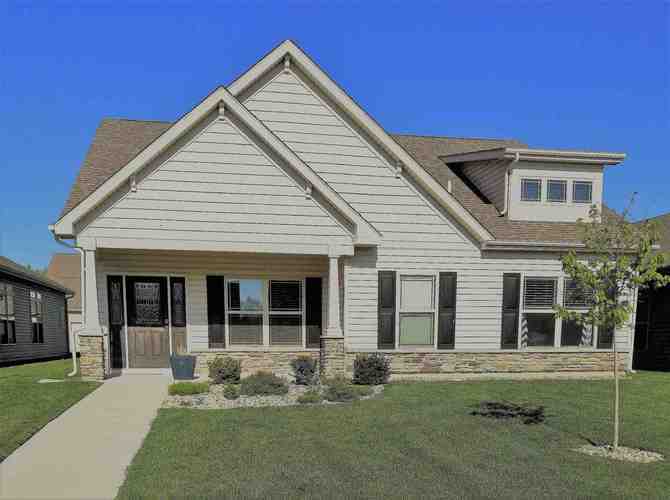 The community, minutes to Purdue, I-65, and convenient grocery shopping, offers walking trails, a clubhouse, ponds, sand volleyball, open fields, and a community pool. Live your best life on Peterborough Road. Directions:52 N, R to 400 W, R to 375 W, R on Monument, R to Peterborough.